This tutorial is using the JSON functionality built into 2016.2+ versions of Caché. This functionality is partially available in 2016.1 but utilizes a different syntax which will not be forward compatible. In post 1, we verified the output of our GET request using a standard browser, and viewing the plain text output on the page. This isn't adequate to test anything more than the most basic scenarios, so we should install something which can craft custom HTTP requests, and then digest the responses. There are numerous options, ranging from the command line curl tool to fully featured test harnesses. 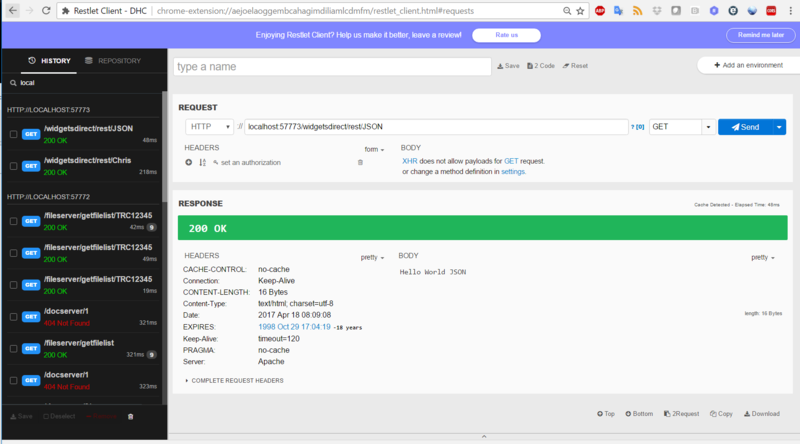 The RESTLET client (formerly called DHC) is available as a Chrome plugin, and provides excellent support for HTTP requests with JSON payloads. This is the client which I will use in all future posts, but any HTTP debugger will work. These posts will not be an Angular 1.x tutorial. There are numerous excellent free tutorials available online. This one was particularly clear and provides a good introduction to the Angular framework. If we now reload our request, we will see properly pretty-printed JSON. There is a difference, but not exactly what we are wanting. We are now displaying the whole JSON object, as our controller is binding the entire data section to the $scope.message. We need to amend our controller to unpack the Message field correctly.